Parking space psychology, originally uploaded by mskogly. AKA: How to tell if your coworkers hate their job by watching how they park their cars. Personally, when I finally get to work, after getting the kids to kindergarden and driving 20 km, I simply pull into the first available parking spot I can find, get my stuff and heads to my desk to crank out some bad code. In “parking lot psychology terms”, this means that I like my job, as do most of my coworkers. But every day there are quite a few people that take their sweet time, and actually backs their car into place, a process that takes up to 10 times as long. 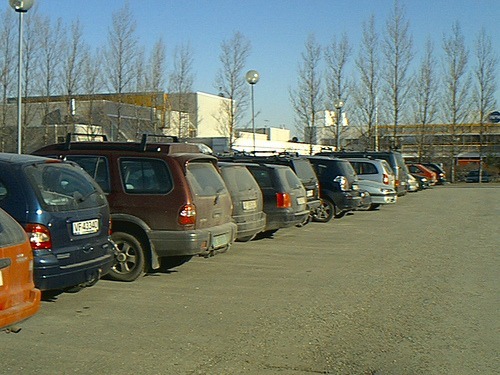 My theory is that the people who back their cars into a parking space like this, simply can’t wait for the day to be over so that they can go back home. They actually spend lots of thought and energy even before coming to work on how they can leave in the fastest way possible.